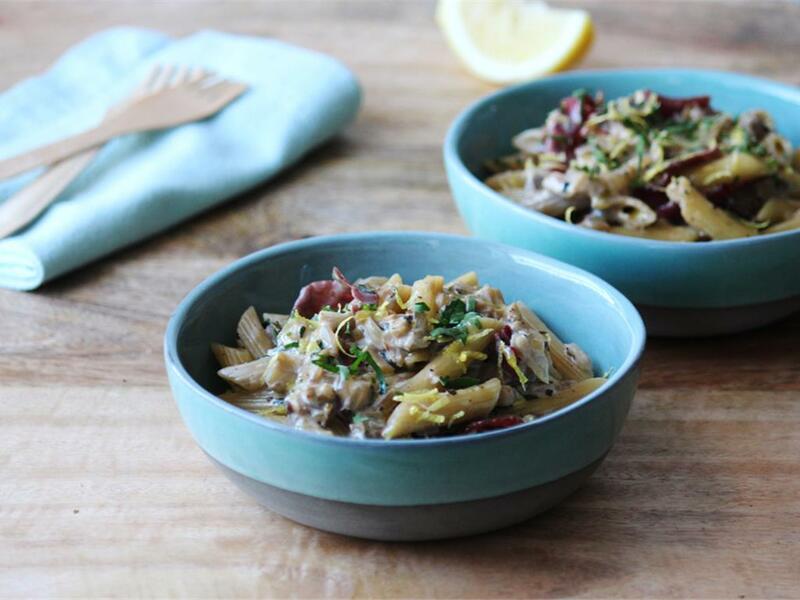 A hearty mushroom & penne dish in a sage infused cream sauce topped with torn bresaola. Penne: Place a pot on medium-high heat and add the boiling water. When the water is at a rolling boil, add the penne and cook for 10 minutes. You want it al dente, which is slightly chewy and translucent. Drain (reserving some of the pasta water) and drizzle with a little olive oil to keep it from sticking together. Mushroom cream mix: Place a pan on medium-high heat with a drizzle of olive oil. Add the onion with a pinch of salt and sauté for 5 minutes until slightly translucent. Add the mushrooms with the sage and cook for another 5 minutes until golden. Add the garlic, cook for 30 seconds then add some water (½ cup for 4; ¼ cup for 2) to deglaze the pan. Pour in the cream and let it simmer (gently boil) for 1 minute. Mix in the lemon zest, fresh parsley and lemon juice to taste. Season with salt and pepper, then add the penne and mix through. Loosen the sauce with the pasta water (if necessary). Serve by topping the mushroom cream mix with the bresaola.